No Man’s Sky always sounded like something of a dream. 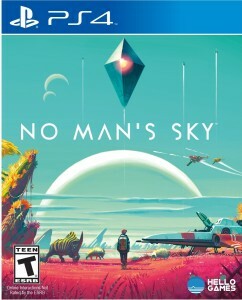 Hop in a spaceship, explore a real-fake universe, traverse the stars using the next-gen power of Sony’s PlayStation 4. Like most dreams it only partially made its way into this reality, arriving like a faint echo. Instead of ushering in a new era of video gaming, No Man’s Sky brought me back to its beginnings. After spending hours plodding along in its algorithmically produced cosmos, I was left thinking of Atari games. The No Man’s Sky box sitting on my coffee table sported a sleek, stylish design with an art deco sci-fi flourish. As I stumbled from one pastel-hued planet to the next, scanning flowers and strange cattle-like creatures, I found myself imagining so much more to all of it. It was the same kind of experience playing Atari games. I remembered being sold on the high-concept, fully-painted cover art of those old games. The Swordquest games come to mind as a prime example, with lush, epic artwork and companion booklets (the collector’s edition of No Man’s Sky even includes a comic book, like Swordquest did 30-odd years before). The Atari itself produced a series of colors and sounds on the television set, of course nothing close to what was promised, and the miscellaneous materials and concepts delivered by the designers was leveraged to provide the greater context. The player’s imagination was a necessary accessory, a translucent layer between the screen and eyes that gave each pixelated square and high-pitched beep a greater meaning. No Man’s Sky follows a similar path. After the initial jump into it, I found that old imagination layer a very necessary element. 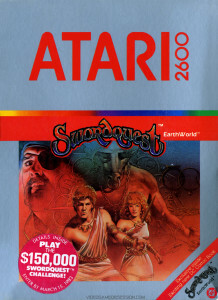 No Man’s Sky brought back memories of old Atari games like Swordquest, which counted on a plethora of external materials and the player’s imagination to fill in the blanks. There’s a lot to like about the philosophy of No Man’s Sky, about the way it unfolds a strange alien universe in a way that feels genuinely strange and alien. The surface-level concepts promised are all present- you do indeed have your own personal spaceship, which you take from planet to planet, star system to star system. Weird relics are sprinkled about, from monoliths to abandoned outposts. Mostly though, there is a lot of empty space. Planets to hike around, caves to descend into, massive distances of space and time to traverse. All of it without another soul in sight. At its core, No Man’s Sky feels like an abandoned MMO. Its landscapes look like they were once populated, but you get the sense that the party ended long ago. It’s massive but empty. It’s no surprise that the universe of the game is created by an elaborate set of mathematics. It reeks of being devoid of a human touch. Again, philosophically all of that makes for an interesting experience. There is something to be said for diving into a surreal digital ocean and going for an extended, mind-numbing swim. The problem is after spending hours collecting minerals, scanning fauna, and flying around, it becomes clear that the game’s mechanics offer little else for you to do. Sure, there are “story” lines to follow, but none of it entails doing anything much more than scanning, surviving, and traveling. Like those old Atari games, if you’re looking for something more then it’s up to you to take that imaginary leap of faith. In the end, No Man’s Sky is a grand idea grafted onto a rather mundane set of gameplay activities. There’s something noble about its efforts, but in this era of unparalleled connectivity, it’s a startlingly lonely experience. I guess in that regard it lives up to its name. This entry was posted in Games and tagged Atari, hello games, No Man's Sky, ps4, sony, sony playstation 4, Swordquest. Bookmark the permalink.